The food safety audits is an integral part of your quality assurance program. The main purpose of our third party inspections is to assure that you are in compliance with the most current regulations, prevent a food borne illnes outbreak, and protect your restaurants and its managers from legal action in the event of an outbreak. It serves to highlight areas in need of improvement that managers and owners often overlook because of their heavy work loads. Our third party audits are valuable as they give your managers a fresh view into what is going right and what is going wrong. A regularly scheduled internal audit can identify problems before a health department inspection or before an outbreak can occur. ServA+ Food Safe Inspections, Inc. inspection reports are very thorough; more thorough than that the state or any city. We set high standards for our customers so that when you are inspected by the state or city you are well prepared to avoid the possibility of being given citations or closed due to non-compliance with the health department regulations. “Remember” or be “Aware” that inspection scores are posted on city websites and most cities are changing their ordinances to make it a requirement that you post your score in public view. 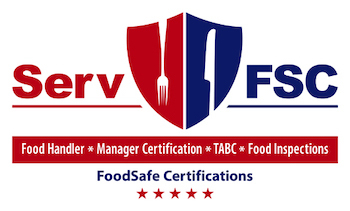 Your customers have a choice where to eat and when they see the ServA+ Food Safe Inspections, Inc. decal on your front door or on your menu, they will rest assured that they are dining in a facility that is inspected by a reputable company with the highest inspection standards. Let us assist you in developing a HACCP plan that best suits your establishment needs while in compliance with city and state regulatory requirements. If you have ever been issued citations, shut down for food code violations, or have trouble with the health department, we can help you by working with you and your health inspector to solve the problems. Often, the solutions include representing you in an official hearing at the health department, certifying additional managers in Food Protection courses, conducting Food Handler training for your staff, and providing food safety audits that are used as training tools for you and assures compliance with the food code for the health department. Are you considering opening a restaurant and do not know where to begin? Let our consultants discuss any questions or concerns you have. Have one of our inspectors do an initial inspection of a perspective site you are considering for your restaurant location. Just because a facility operated as a restaurant once before does not mean that it can be re-opened “as is” under new ownership. Some establishments fail into what health departments call “grandfather clause”. The “grandfather clause” s non-existent once an establishment has a change of ownership. The new owner will have to upgrade the facility to the current health code regulations before operating. Are you ready to open and need assistance? Do not get delayed opening for business because your city inspector denies approval due to non-compliance and has up to 72 hours to conduct a re-check which will delay your opening day and mean loss of revenue. Let us help you be ready for projected date of opening without delay. What are the laws and requirements for restaurant owners? Health code laws and ordinances can be a little overwhelming to those who are new to the restaurant industry. Let our staff hellp educate you and your staff. Call us for a consultation.